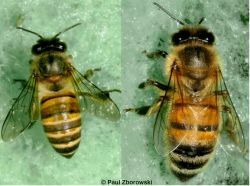 Asian honey bees (Apis cerana) can be easily confused with common European honey bees (Apis mellifera), and other local native bees. 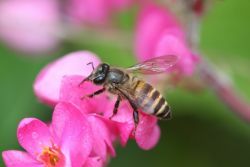 Ensure you are able to identify Asian honey bees before organising to have the bees removed, as European honey bees and native bees are important to our environment for pollination and honey production. Do they nest inside a cavity? Little black bush bee 4mm Black Black No No Yes - bees will loosely fly around the entrance. Entry hole to nest is very small. 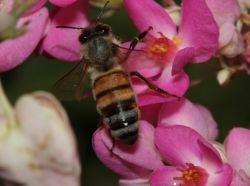 If you have seen an Asian honey bee swarm or nest outside of Far North Queensland, upload a picture using the online reporting form. 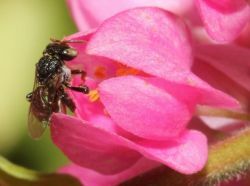 This information will help Biosecurity Queensland track the spread of the pest bee in Australia. Alternatively, contact the Customer Service Centre to report a sighting of suspected bees.